THE LARGE SIZE SANDWICH BOX FEATURES AN ASSORTMENT OF TOGO'S SIGNATURE SANDWICHES. CHOOSE FROM THE ITALIAN, TURKEY AND CHEESE, HAM AND CHEESE , ALBACORE TUNA, ROAST BEEF OR AVOCADO AND TURKEY. PICK YOUR FAVORITES. AND ALL MADE WITH YOUR FAVORITE FIXINGS. 24 HALF SANDWICHES PER TRAY. PLUS, A FARMER'S MARKET SALAD, TOMATOES, CUCMBERS, CARROTS, RED CABBAGE, RED ONIONS, PEPPERONCINIS AND FETA CHEESE ON ROMAINE LETTUCE. SERVES 12. PERFECT FOR PARTIES, GATHERINGS AND TAILGATING. 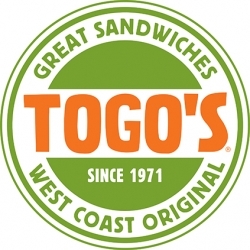 TOGO'S MAKES BIG SANDWICHES WITH FRESH ORIGINAL TASTES YOU WON'T FIND ANYWHERE ELSE. COLD AND HOT SANDWICHES, SALADS, SOUPS AND TRAYS FOR LARGE CROWDS. BIG, FRESH, MEATY TOGO'S.LIMIT ONE CERTIFICATE PER VISIT. 24 HOUR NOTICE PLEASE. NO SUBSTITUTIONS.